Courtney and Ryan chose the trendy and newly restored Armature Works along downtown Tampa’s Riverwalk as the venue for their wedding ceremony on a beautiful afternoon in late February. Courtney looked gorgeous in her wedding gown as she was escorted down the aisle by her father and mother to join Ryan under their wedding arch. There, the couple shared their custom designed vows (including a surprise poem read by her sister and Maid of Honor), exchanged rings, and were pronounced husband and wife by Rev Rick Lackore of Sensational Ceremonies. A string quartet, provided by Bella Musica, played a custom playlist created by the bride and groom which included the song Jump by Van Halen. Lighting and DJ Entertainment was provided by On The Move Productions, videography and this Sneak Peak Film provided by Trinity Wedding Cinema, and Bride’s Bouquet provided amazing florals and decor. 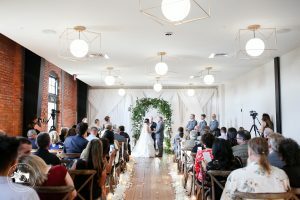 Venue coordination provided by Olivia, and the rest of the staff at Armature Works, and flawless wedding coordination provided by Kelly and her staff with Blue Skies Wedding and Events. Special thanks to Buffy and her team with Lifelong Photography Studio for providing beautiful photos of this memorable occasion. Congratulations to the new Mr. and Mrs. Ryan Langford!